When cloud Business Intelligence (BI) first became available, every analyst thought it would be like Salesforce.com – if you win in the cloud, you’re going to win BI globally. But this hasn’t eventuated because cloud BI isn’t a silver bullet that solves all the challenges of BI, it’s just about deploying software in different place. 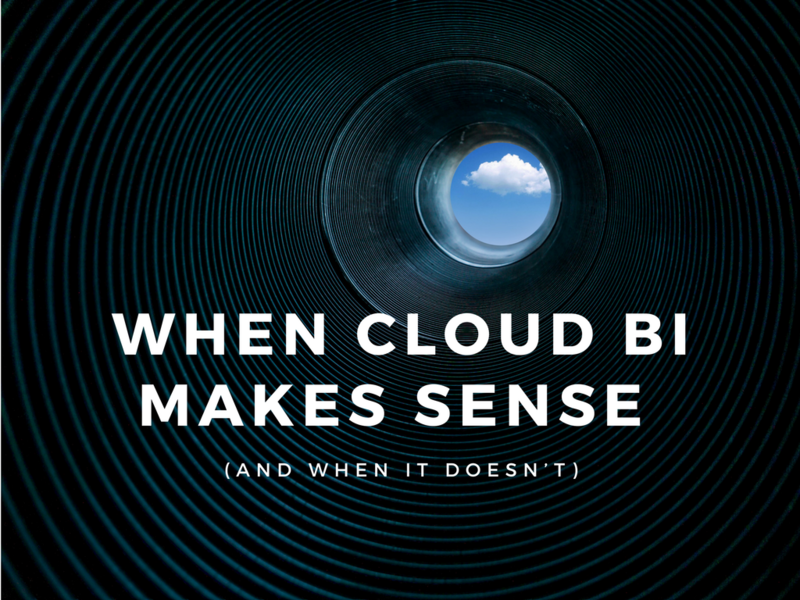 The same challenges that existed with on-premise BI continue to exist in the cloud. I have a strong opinion that it’s not necessary for a BI vendor to have a cloud story to be successful today. If a BI platform can be put in the cloud, like Yellowfin, that’s great. But it doesn’t mean that you have to run the cloud. This isn’t well understood in the marketplace. There’s an unrealistic expectation that software vendors should be both a service provider and a software developer. But these two businesses are very different. If your core strength is building software, there’s no need to shift your focus away from your specialization – you’ll only end up providing an ordinary cloud platform for your customers. There are other businesses who specialize in cloud services and they do a great job of running cloud platforms. At Yellowfin, we partner with Toustone in Australia and NTT Communications in Japan to provide cloud services. They have their own infrastructure and offer cloud services – they manage the platform, look after the deployment and make sure the cloud can ingest all the data required. One of the common misnomers about cloud BI is cost – people think it’s going to be cheaper but it’s not. There are almost no economic benefits between moving to the cloud and having BI on-premise. In fact, cloud BI may end up costing more in the long-run because of the hidden costs that many are not aware of. The biggest hidden cost with cloud BI is the lock-in. If a cloud provider is pulling data from on-premise and putting it into the cloud, they will store it in their proprietary database. This essentially locks your business in with that vendor. If you choose to leave that vendor, you will literally have to turn the switch off and start again. This risk makes cloud BI potentially very costly to exit. As 80% of the work effort in BI is data preparation, it’s essential that businesses maintain control over the data structure so they can reuse it with any BI vendor in the future. But if a cloud vendor holds all your data then you may lose access to it if you change vendors. Even without the lock-in risk, cloud BI can become expensive very quickly when you ramp up. The centre of gravity for any BI solution is the underlying data. If your data lives in the cloud then it certainly makes sense to move your BI to the cloud. If data is held on-premise or scattered across multiple applications, then the cloud will generally provide marginal value to your business. Dan Sommer of Qlik, previously of Gartner, correctly argues that BI should be deployed wherever the data is located. The location of your data is the gravity that pulls you to where you should deploy your BI application. At Yellowfin, our strategy is to allow our customers to deploy our solution wherever they want. Our partners can deliver and manage via the cloud. If a customer wants it on-premise we can help them do that too. This allows customers to make the best decisions for their business, rather than being forced into a cloud or on-premise solution. With that issue removed, customers can focus on the more important aspects of whether the cloud is right for them.